Players of Money Magic video slot at Ruby Royal Casino have the chance to win a progressive jackpot that has just grown past the $10,400 mark. 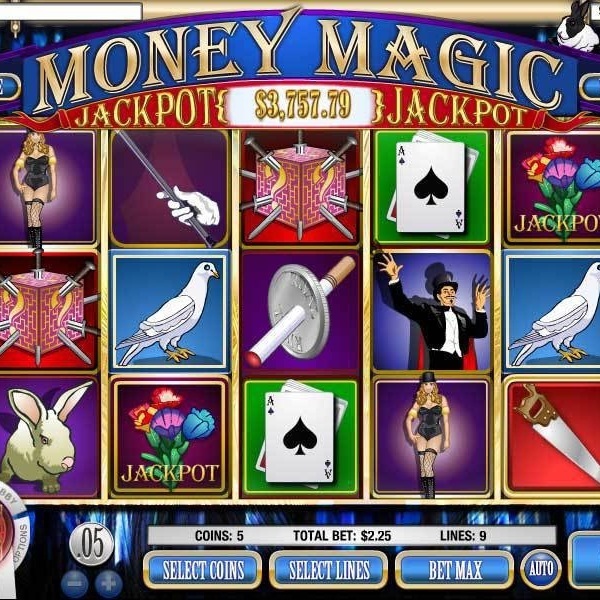 Money Magic is a 5 reel, 9 payline video slot built on the theme of a conjuring show and features symbols such as magic wands, rabbits, top hats, saws and a magician’s assistant. To win the jackpot players need to place the maximum bet and land five flower symbols across an active payline. Four flower symbols wins 1,000 credits while five saws wins 800 credits. The flower icon is also wild and the assistant is a scatter symbol that can award multipliers of up to 75x. The Money Magic jackpot is won fairly often, on average every five months and has paid out amounts ranging from $5,324 right up to $299,673 so the next winner could come along at any time.